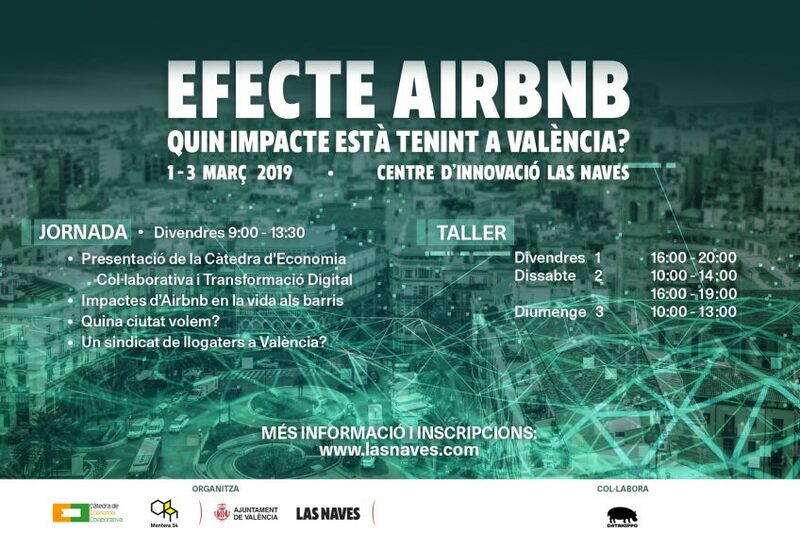 We had the pleasure to participate as Fairbnb at the “Airbnb Effect” event in València. For Fairbnb as a network it was a very valuable experience since we’re designing the Local Node Activation Strategy as a methodology to promote local communities as opportunity spaces where local hosts, neighbours, local social projects and guests can meet to discuss local policies, create support teams, foster Fairbnb vision locally and create an alternative economic model around tourism. The event “Efecte Airbnb” organized by Montera 34 with the Collaborative Economy Chair from the Universitat de València and Las Naves was an opportunity to involve citizenship, politicians, hosts, guests and local associations to collaboratively analyze the impact of the current vacation rental platforms in the city. An encounter space where to meet different local realities, local neighbour associations, social projects, people from the municipality, and people from the Barcelona and Madrid tenant unions. During the encounter space and after a short presentation of the different invited participants we witnessed a confrontation between what at first sight appeared as very different positions. Later we discovered there’s a lot of potential to collaborate to create a shared and agreed local touristic model. Collaboration and constructive work happens when doing specific stuff. During the presentation and debate space the discussions were not as constructive as they could be. The debate happened as a confrontation amongst two opposing realities, not as two local realities that could dialogue to improve their city. During the second and more practical part this totally changed to a more constructive and collaborative approach to get things done together. The workshop followed with a more practical session working on data analysis to better understand the current state of the vacation rental in the city. The goal of this workshop was to learn how to use tools for obtaining, cleaning and analyzing data from scratch to produce clear documents and visualizations to show in an objective way the real impact of these vacation rental platforms in our cities. The workshop and the different analyzed topics where decided in a collaborative way. Everyone could propose a topic, a problem to analyze, so with the help of the tutors and the different tools and methods provided we could answer them organized in several groups. During this phase we started knowing several analysis and visualization tools and defined what questions we wanted to understand and which realities we wanted to analyse. Producing quick data visualization and analysis prototypes. Improving results, creating clear visualizations and taking care to make it open and understandable the whole process to enable other people to reproduce or contribute to it. It was a very useful and fulfilling experience to see how the different attendees, from very different backgrounds, could get the needed tools and methods to really understand their reality based on objective data. This was very important to have a starting point from where to build an informed opinion to contrast with other participants. I would like to stress how during the workshop we could witness how the different and even opposing opinions started to work together, to collaborate, to better understand the reality and even to get a wider vision of the opinion of their interlocutor. Working with data gives an objective vision of reality. It helped to even relax positions and show that, sometimes, the assumptions were more exaggerated than the reality and were also based on not the correct data or source. It is super important to work from a very constructive point of view. We don’t need to start putting the focus on the problem. The exercise was very interesting because there was not a specific goal. We were not there to agree on something, to collectively design policies, but just to be creative in the way we analyze reality. There’s a lot you can do to help us. Choose the most interesting one for you and more useful for Fairbnb. Fairbnb: let’s build together a better world!